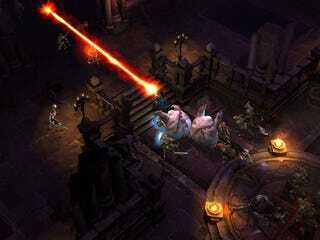 Blizzard followed up the announcement of the wizard class for Diablo III at the opening ceremonies of BlizzCon 2008 with a Diablo III design panel, during which designer Wyatt Cheng explained some of the powers and background of the latest addition to the fight against evil. The wizard isn't about drawing runes or casting bones. The wizard is a character class that manipulates the laws of the universe in order to get things done. She's all about High Magic - no alchemy, no scrolls, no mystical symbols - just explosions, explosions, and more explosions. Personality-wise the wizard is a bit of a rebel. Ambitious, perhaps even power hungry, the wizard is the kind of person who pays no attention at all in class yet still manages to ace her magic exams. Everybody expects her to fail, but she's got the power and desire to come out on top. What powers? Hit the jump for a few hit the jump for a few of the tricks she's got up her sleeves.Magic Missiles: Was an important skill choice. Fireballs, ice bolts would have set her up to be an elementailist. The higher the level the more missiles. Electrocute: Part of the Wizard's weather control discipline. Controlling weather feels epic. Slow Time: Part of the reality control kit for the wizard. RPG games don't generally manipulate time. It's a slow time bubble, for multiplayer use. Disintegrate: The real face melter. Nothing like it has been in a Diablo game before, but it feels very Diablo. Hold down the mouse and a beam shoots out. So awesome. IT originally started as a charged swing for the Barbarian class that you'd have to hold down the mouse to charge and the release when finally charged. Teammates would kill the monsters, leaving you alone, and you'd still be waiting for the power to go off. Now you hold down the beam and it comes grows in power as a monster is hit. So that's what we have on the wizard so far. She's a glass cannon class, basically. Over-powered yet severely under armored. My kinda girl.